The portico (porch at the entrance of a building or a colonnade) of 4th century AD Roman building has been discovered during the October 2015 excavations of the Ancient Roman city of Colonia Ulpia Traiana Ratiaria in Bulgaria’s northwestern town of Archar on the Danube River. During their digs, the archaeologists led by Assoc. Prof. Dr. Zdravko Dimitrov from the National Institute and Museum of Archaeology of the Bulgarian Academy of Sciences, and Ilko Tsvetkov from the Vidin Regional Museum of History have also found the hypocaust (underfloor heating) in the atrium of the residence of the provincial governor of Ratiaria which was excavated in full in 2014. In 271 AD, Roman Emperor Aurelian (r. 270-275 AD) transformed the province of Moesia Superior into the province of Dacia Aureliana with its capital at Serdica (today’s Sofia), after vacating Dacia Traiana beyond the Danube. Around 283 AD, Dacia Aureliana was divided into two provinces, Dacia Mediterranea, with its capital at Serdica, and Dacia Ripensis (“Dacia from the banks of the Danube") with its capital at Ratiaria (Colonia Ulpia Ratiaria). 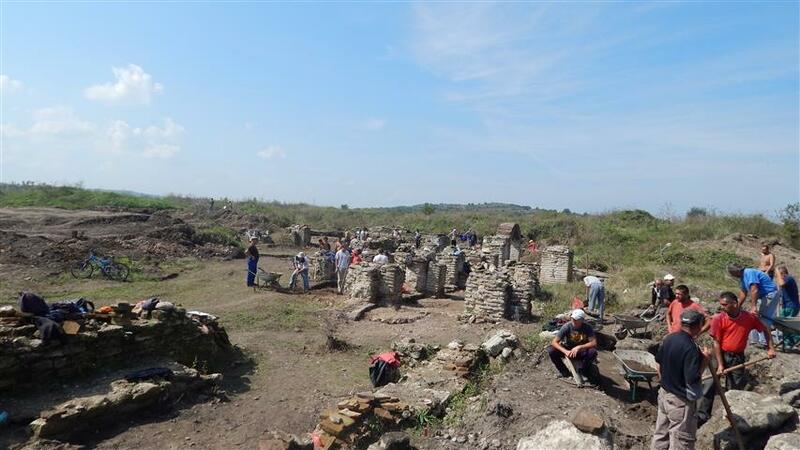 The Roman building whose portico has now been discovered by the Bulgarian archaeologists in Ratiaria is located north of the governor’s residence, Radio Vidin reports. In addition to the portico, i.e. a porch leading to the entrance of a building, or extended as a colonnade, the archaeologists have also unearthed the stylobate, the platform upon which colonnades are placed. The archaeologists point out that during their digs in 2014, they found 4-5 bases of columns that used to be part of the portico that they have now uncovered. Unfortunately, the bases had been removed from their original places and tossed around by looting treasure hunters. During their 2015 excavations, which have been really brief because of the meager government funding, the researchers have also found a number of Roman coins, mostly from the 4th century AD, as well as another column base from the atrium of the provincial governor’s residence. All in all, the buildings that they have been focusing since the excavations of Ratiaria were resumed in 2013 (for the first time since 1991), date back to the height of the Roman colony, the 3rd-5th century AD, when it was the capital of the Late Roman province of Dacia Ripensis. In modern-day Bulgaria, Ratiaria is known as the place of extremely barbarian destruction since its ruins, which had been almost perfectly preserved until the 1980s when the site was excavated by Bulgarian and Italian archaeologists, have been ripped apart by treasure hunters in the years since 1990-1991. Yet, archaeologists Dimitrov and Tsvetkov are positive that a lot of the architectural riches of the once glorious Roman city have been preserved underground, and can be properly studied, conserved, and exhibited in situ if sufficient funding is allocated. “We are seeing entire quarters of the city emerging from the ruins, and we understand very well situation of the site. [If we] have the opportunity to carry out annual excavations with adequate funding, it is possible to study an entire quarter in a period of 5-10 years, and everyone will be able to see what a Roman city looked like. We will expose the streets, the neighborhoods, and some major public buildings such as the thermae (baths), and the governor’s residence," says Dimitrov. Unfortunately, Bulgaria’s Ministry of Culture had provided only BGN 12,000 (app. EUR 6,200) for the 2015 excavations of Ratiaria. Thus, the 2015 digs have lasted for only three weeks. In comparison, in 2014, the government funding for the summer digs at Ratiaria was BGN 80,000 (app. EUR 40,000), and even in 2013 when the research of the Roman city was resumed for the first time in 25 years, the sum was greater – BGN 15,000 (app. EUR 7,600). “[In 2014,] we excavated for 2-3 months, with about 50 workers, while we have now worked for only 3 weeks with 15 workers," explains the lead archaeologist. “The work that we got done is part of our overall plan to study first the quarters around the governor’s residence, and between the residence and the thermae which we found in the northern part of Ratiaria," he adds. Dimitrov points out that despite the decades of treasure hunters’ looting, the architectural complexes of Ratiaria are “rather well preserved", and the once huge Roman city offers potential for both in-depth scientific research, and for the development of cultural tourism. However, all of that would require proper funding because the 2015 digs were limited to an area of about 100 square meters. “We have come across fully preserved archaeological layers and architecture from the period when Ratiaria was a [provincial] capital, the 3rd-5th century AD, and possibly in its richest quarters since they are located next to the very residence of the provincial governor. The treasure hunters have only dug down to a certain level, and a lot of things have been preserved below that. The big question that arises here is what is to be done in order to protect these things. This is an even bigger problem than funding," Dimitrov elaborates. The archaeologists think Bulgaria’s central government and local authorities must wage an incessant campaign against the treasure hunters if they are to preserve whatever is left of Ratiaria, which was a Roman colony, and was thus equal in status to Rome, one of a total of three Roman colonies on Bulgaria’s present-day territory. While the local authorities in Dimovo Municipality pay security guards for guarding Ratiaria during the day, the ruins are left to the mercy of the treasure hunters at night. Dimitrov has reminded a case of a treasure hunting raid in Ratiaria from the spring of 2015 targeting precisely the spot where the 2014 excavations were conducted. “Perhaps the treasure hunters are trying to discourage us, I don’t know," he concludes. “The most important thing is to have restoration. To find money and invest in the restoration and promotion of the site, instead of just exposing these structures, because if they are not preserved, everything is pointless," says his colleague Ilko Tsvetkov in turn. He adds that while the treasure hunters have done much damage to the once perfectly preserved ruins of Ratiaria, they have tossed around and left behind a lot of items such as columns, which can easily be put back to their original places by the archaeologists and restorers if there is funding and a project for the restoration of the Roman city. “These damaged and displaced architectural elements can be returned to their places once the entire architecture is revealed; the buildings can be restored, the streets will be visible, and the entire Roman city can have a very decent and authentic look," he adds. The archaeological excavations at Ratiaria were terminated for lack of funding in 1991, and in the following years the once well preserved archaeological complex has been brutally looted and excavated by scores of treasure hunters – from poor local diggers to well-organized antique trafficking mobsters. It is alleged that in the 1990s the Roman city was bulldozed by the local mafia with the alleged participation of some government officials, while local Roma clans have been picking at the archaeological site by hand for decades. The treasure hunting plight of Ratiaria (and Bulgaria, for that matter) was documented in a 2009 documentary of Dateline on Australia’s SBS TV entitled “Plundering the Past". This film pretty much makes it clear that the looting of Ratiaria keeps taking place on an hourly basis so announcements about new damages are no news. The overall damage sustained by the Roman city from modern day treasure hunters can hardly be calculated. Ratiaria, also known as Colonia Ulpia Traiana Ratiaria, is an Ancient Roman arsenal city located on the right bank of the Lower Danube, near today’s Bulgarian town of Archar, in the Vidin District. Some scholars believe that the city of Ratiaria was first founded by the Thracian tribe Moesi in the 4th century BC, near a gold mine. In 29 BC, the Moesi were defeated by Roman general Marcus Licinius Crassus sealing the Roman conquest of today’s Northwest Bulgaria. All of Ancient Thrace south of the Danube was conquered by the Roman Empire in 46 AD, and in 87 AD, Roman Emperor Domitian (r. 81-96 AD) organized the region of Moesia into the Roman provinces of Moesia Superior (in today’s Northwest Bulgaria and Eastern Serbia) and Moesia Inferior (in today’s Northern Central and Northeast Bulgaria, and the Romanian part of the region of Dobrudzha). It is assumed that the Roman arsenal city of Ratiaria was set up during the reign of Emperor Vespasian (r. 69-79 AD). After the Roman conquest of the Dacians, the Thracian tribes north of the Danube, in 107 AD, Ratiaria became a colony in Moesia Superior under the name Colonia Ulpia Traiana Ratiaria, taking the names of its founder, Roman Emperor Trajan (r. 98-117 AD). In 271 AD, Roman Emperor Aurelian (r. 270-275 AD) transformed the province of Moesia Superior into the province of Dacia Aureliana with its capital at Serdica (today’s Sofia), after vacating Dacia Traiana beyond the Danube. Around 283 AD, Dacia Aureliana was divided into two provinces, Dacia Mediterranea, with its capital at Serdica, and Dacia Ripensis (“Dacia from the banks of the Danube") with its capital at Ratiaria (Colonia Ulpia Ratiaria). The name of Ratiaria is derived from the Latin word “ratis" (raft) or from “ratiaria", a type of vessel, signifying its significance for the Roman Navy, especially since only two of all Roman frontier outposts on the Limes Moesiae have names connected with sailing – Ratiaria and Sexaginta Prista (meaning “Port of the Sixty Ships", today’s Bulgarian city of Ruse). As the capital of Late Roman province of Dacia Ripensis, Ratiaria served as the seat of the military governor and the base for Legio XIII Gemina (the 13th Twin Legion). Colonia Ulpia Ratiaria was the home of many Roman patricians (aristocrats). According to 7th century Byzantine historian Theophylact Simocatta, the city of Ratiaria existed until 586 AD when it was destroyed in a barbarian invasion of the Avars. The Ancient Roman city of Ratiaria is located on a high terrace with an area of 60 hectares (app. 148 acres), overlooking the Danube River, about 30-40 above the river; from the east and south it is surrounded by the Archaritsa River. It was mentioned by Greco-Egyptian ancient geographer Claudius Ptolemy (ca. 90-168 AD) in his work “Geography" in the 2nd century AD, and was marked in the 4th century AD Tabula Peutingeriana (the Peutinger Map showing cursus publicus, the road network in the Roman Empire, covering Europe, North Africa and parts of Asia), and was mentioned in the so called Antonine Itinerary (Itinerarium Antonini Augusti, “The Itinerary of Emperor Antoninus"), an Ancient Roman register of road stations. The name Colonia Ulpia Traiana Ratiaria is first mentioned in a Roman inscription from 125 AD. Other inscriptions discovered by the Bulgarian and Italian archaeologists excavating the site in the 1980s indicate that the city of Ratiaria had a lot of resident settlers from the Italian Peninsula as well as aristocrats of Eastern origin. One of the finds is a rare inscription dedicated to the Roman deity Pales, a patron of shepherds, flocks, and livestock. Unfortunately, the collapse of the communist regime in Bulgaria affected negatively the research and security of the Ancient Roman city. The archaeological excavations were terminated for lack of funding in 1991, and in the following years the once well preserved archaeological complex has been brutally looted and excavated by scores of treasure hunters – from poor local diggers to well-organized antique trafficking mobsters. It is alleged that in the 1990s the Roman city was bulldozed by the local mafia with the alleged participation of some government officials, while local Roma clans have been picking at the archaeological site by hand for decades. The treasure hunting plight of Ratiaria (and Bulgaria, for that matter) was documented in a 2009 documentary of Dateline on Australia’s SBS TV entitled “Plundering the Past". The damage done to one of the largest Roman cities outside Italy can hardly be calculated. 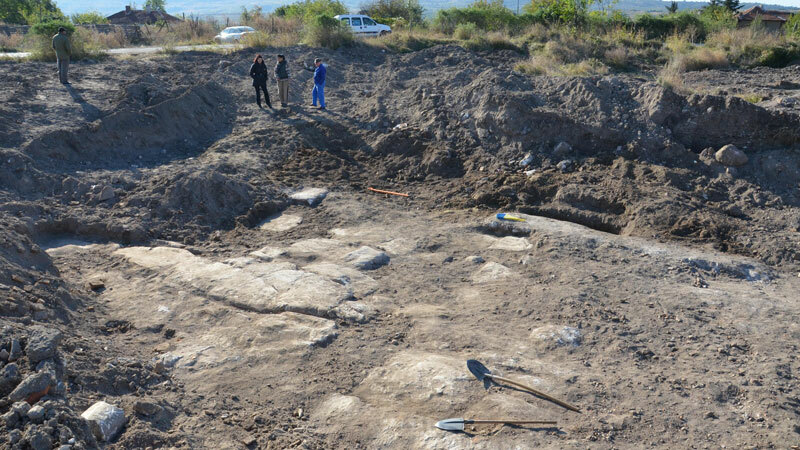 The archaeological excavations of Ratiaria were resumed in 2011 by archaeologist Krasimira Luka from Sofia University “St. Kliment Ohridski", and in 2013 by Assoc. Prof. Dr. Zdravko Dimitrov from the National Institute and Museum of Archaeology of the Bulgarian Academy of Sciences.